The turtle races at Brennan’s in Marina del Rey are one of Los Angeles’ longest-running Thursday night traditions. And though the frequency has decreased, and the bar has a whole new look, there’s no better time to check these little speedsters out. 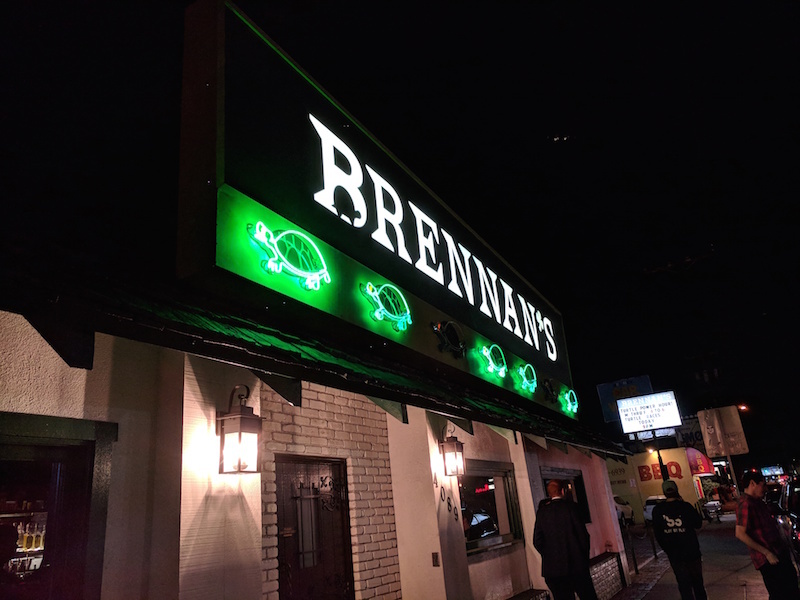 Brennan’s, an Irish watering hole established in 1972, has been racing red-eared slider turtles for an adoring public since 1974. In late 2017, the pub was acquired by Artisanal Brewers Collective (ABC), the same group now running Sixth Street Tavern and Spring Street Bar in downtown L.A. and Tony’s Darts Away in Burbank. 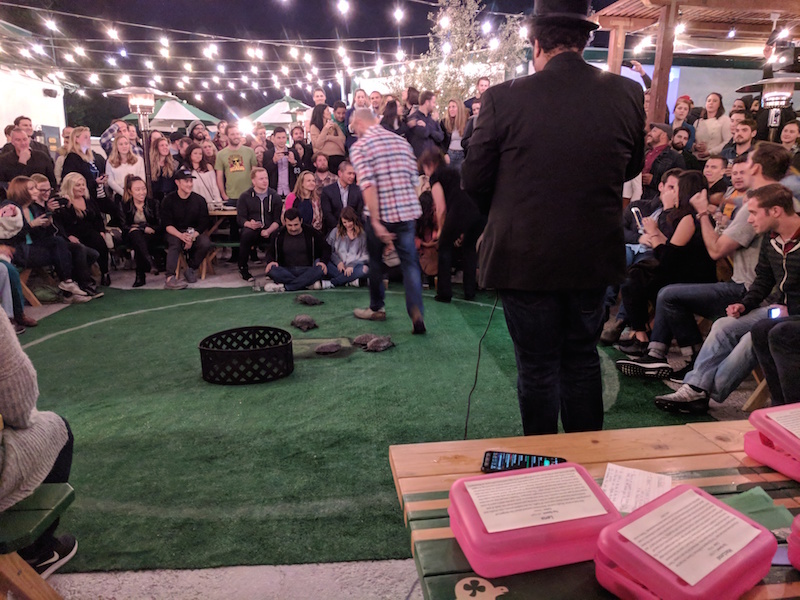 After a significant overhaul of the space, menu, and turtle habitat, a new Brennan’s looks to expose the next generation of Angelenos to the slow-paced excitement that is turtle racing. Red-eared slider turtles are one of the most popular reptile pets in the U.S. However, these turtles can easily become an invasive species if released into the wild, especially considering their average lifespan is about 30 years. These little reptiles are, thus, Brennan’s lifters, and some some of them have already been living at the pub for going on two decades. Before the remodel, the turtles raced every Thursday. Now, after consulting with a herpetologist, Brennan’s has elected to only race the turtles on the third Thursday of each month at 9 p.m. 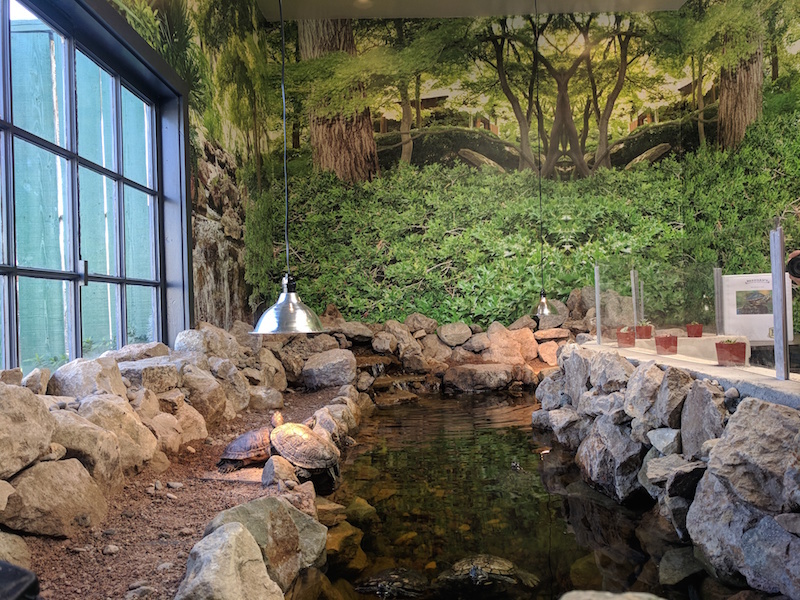 The turtles also have a freshly renovated habitat with increased space for swimming and basking in natural light, as turtles are wont to do. All this to say, Brennan’s turtles are now happier and healthier than they were before. The races once took place in the parking lot, but the heats now go down on the remodeled patio. The ‘track’ is more like a large square of Astroturf with a dot in the center. A circle near the outer edge of the Astroturf signifies the finish line. All competing turtles in any given heat are placed in the center and blocked by a plastic gate. When the gate is lifted, the first turtle to meander outside the finish line wins. The fastest turtle race in Brennan’s history was a mere 1.8 seconds, while the longest was an interminable 24 minutes. Guests each receive a complimentary raffle ticket with beer purchases, which they can put in a small plastic box marked with their favorite turtle’s name. Each turtle has its own backstory, accounting for its life before retiring to the races. Banjo, for instance, was once a member of a rock band, while Marley was a celebrated breakdancer. If one can’t decide among the many contenders, additional raffle tickets may be purchased for $2-3. Guests cheer on their turtle of choice, but they are not allowed to point during the individual heats. That’s considered bad turtle racing etiquette, and it could distract the racers. The turtles compete throughout the evening in a series of heats until a final victor is determined. Winners of the night’s raffles win prizes including gift cards, Brennan’s swag, or free beers. In addition to new turtle digs, the bar and patio have also been overhauled. 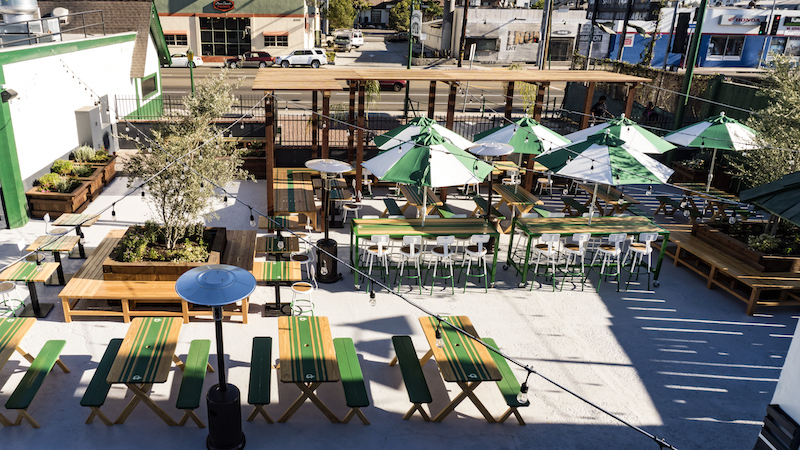 The patio, in particular, has been outfitted with benches, seating, greenery, heat lamps, and a set of stadium bleachers for watching the races. The menu has a new look, too, adding several vegan options including a colorful crudite, a handful of pizzas which can be served vegan or not, a mushroom pate with horseradish and mustard seeds, and the famed Impossible burger. Other items include a spicy chicken melt, steamed clams, and a shrimp roll. 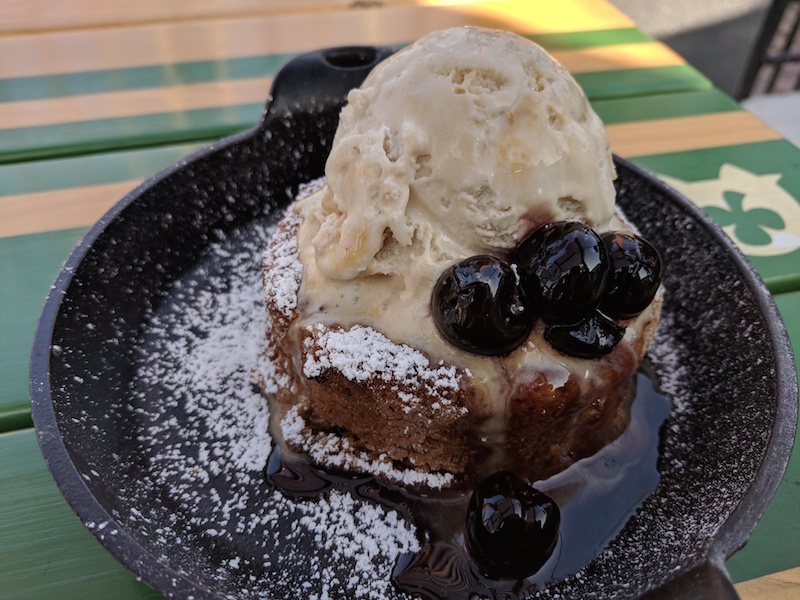 For dessert, the surprisingly creamy, yet totally vegan butter cake is a must.